There’s so much happening at the end of this month in Los Angeles that I can barely fit them all in one post so I’ll do my best to sum up the events. At 7:00 PM at a location that we’ll announce soon (in the LA Area) we’ll be showing Adam Carolla’s critically acclaimed Winning: The Racing Life of Paul Newman for free, with drinks and food available. If you buy one of the VIP tickets (on sale for an early bird price of $50) you also get a voucher for food and drinks. Following the screening Matt Farah will hold a Q&A with Adam Carolla to talk about the film. After that, we’re going to have a bigass party until they kick us out. You’re going to have to RSVP for this event and we’ll have the RSVP page up soon with another announcement. Stay tuned. Do you love films? We love films. We’re going to have a full day of screening at the historic and beautiful theater at the Theatre at Ace Hotel Downtown Los Angeles. This, you will need a ticket for, and you can get the $25 general admission ticket, which gets you into all the films, or the $75 VIP ticket (currently $50 on early bird until we sell out), which includes popcorn and a drink and lunch, as well as the special perks on Friday. 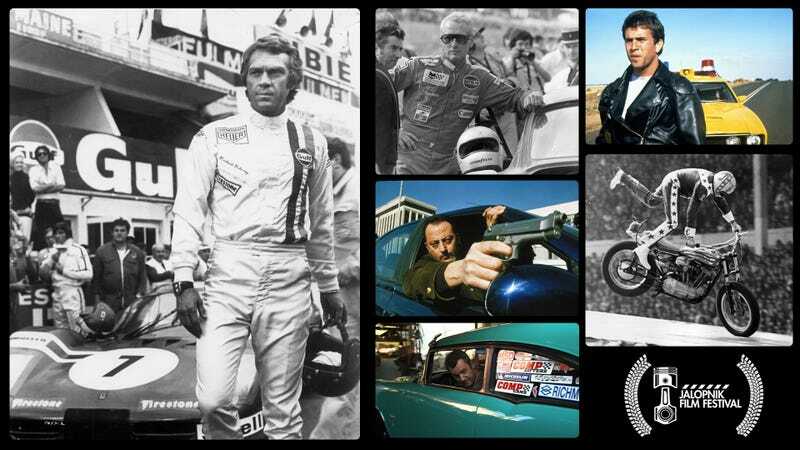 Steve McQueen: The Man And Le Mans - Le Mans may be adored by car film enthusiasts, but this documentary captures the high price Steve McQueen paid professionally and personally to get the film made. Mad Max (The Original) - George Miller imagines a post-apocalyptic world with cars so amazing you find yourself rooting for the end of the world. All Cars Go to Heaven, Part Two - A sneak preview of the second installment of The Smoking Tire’s road trip epic. Havana Motor Club - This stirring documentary captures the spirit of underground Cuban car enthusiasts trying to hold the first sanctioned race since the 1959 Revolution. Jalopnik on YouTube Season Two Preview - We’ll be showing a preview of our new season of shows for our YouTube channel before anyone else gets to see it. Being Evel - The story of America’s greatest daredevil Evel Knievel as told by superfan Johnny Knoxville. Ronin -Many car buffs and film buffs believe Frankenheimer’s spy classic is secretly the best car chase movie ever made. In Loving Memory -More than 240 competitors have died at the Isle of Man TT and this short film captures the spirit that draws them back every year. Jalopnik Short Film Contest Selections - The 11 short films selected by our panel of esteemed jurors, representing the best work of some familiar talent and some new directors. We’ll also have panels with directors, writers, actors, and stunt people but we’re running out of space and we don’t want to overwhelm you with all the awesome. We’ll also be handing out awards to the best filmmakers, including the audience choice award. The best way to experience all of this is to be in Los Angeles on September 25th and 26th and buy a ticket (VIP early bird here or a regular ticket). Even without a ticket you can take part on that Friday and come to the party to watch a big, free screening of Winning with Adam Carolla and the entire Jalopnik team. There might also be stickers. Just saying. Planning to come? Let us know in the comments and we’ll look out for you.